St Andrew’s has a fine pipe organ which is used during most of our services, especially for accompanying the more traditional hymns. Built in 1968, St Andrew’s organ derived most of its pipes from an organ at Gresham’s School in Norfolk which was being dismantled. The composer Benjamin Britten was a pupil when the organ was there, so he may well have played ’our’ organ. The organ was built by the well-respected firm of J W Walker and Sons, and comprises great, swell and positive manuals and a full pedal board. 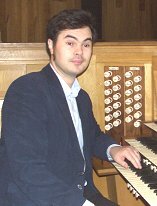 The organ is available for practice or teaching at the discretion of the organist, Aelred Smuland. Aelred also teaches organ pupils. For further details please contact him. Also in the church we have a Petrof grand piano, acquired in 2016 as a memorial to the late Mr Findlay Picken. A list of hymns and songs with which the congregation is familiar is here. Our choir has become rather depleted in recent years, and we would welcome new singers in all voice parts. We lead the singing at the Sunday service, especially after the band leaves us. We meet to rehearse on Friday evenings at 8:00pm. Contact the choir leader, Peter Campbell Smith for details. 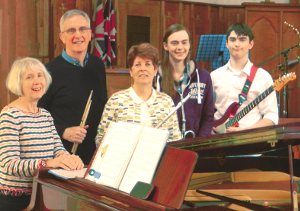 Our worship band leads us in contemporary praise at the start of our Sunday service, after which some of the musicians leave to lead or take part in Junior Church or ConneXions. We use whatever instrumental players God sends us, young or old, and ask that they are at least around grade 5 standard. We also seek lead singers to sing with the band from age 12 upwards. The band rehearses from 9:00 - 10:00am on Sundays. Contact Steffi Campbell Smith for details.